Eight local Edmonton businesses join the pack, Team Toby, to sponsor books for children that stay at Ronald McDonald House Edmonton. 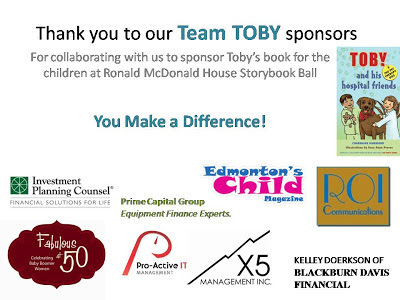 To kick off this initiative, these eight sponsors provided books for the children attending the Ronald McDonald House Story Book Ball. Toby was a therapy dog, and while he didn't have the chance to volunteer at Ronald McDonald House... this was on our bucket list. This is part of the Million Acts of Kindness .... Toby's Global Mission. You can watch as Charmaine Hammond, author of Toby The Pet Therapy Dog & His Hospital Friends thanks the sponsors for their support, and welcomes them to the pack....Team Toby!